Amazon has just released its third-gen Kindle Paperwhite e-reader, and while it doesn’t offer a substantial upgrade over the previous model, it does iterate on what was already a fantastic device. With a 300 ppi screen and brand-new Bookerly font at-the-ready, there’s not much to dislike with this e-reader. It’s been nearly two years since the second-gen Kindle Paperwhite was released, and three years since the original first hit the scene. Does that mean that the third-generation Paperwhite, with its staggering two-year gap, becomes a major update to the series? Not quite. 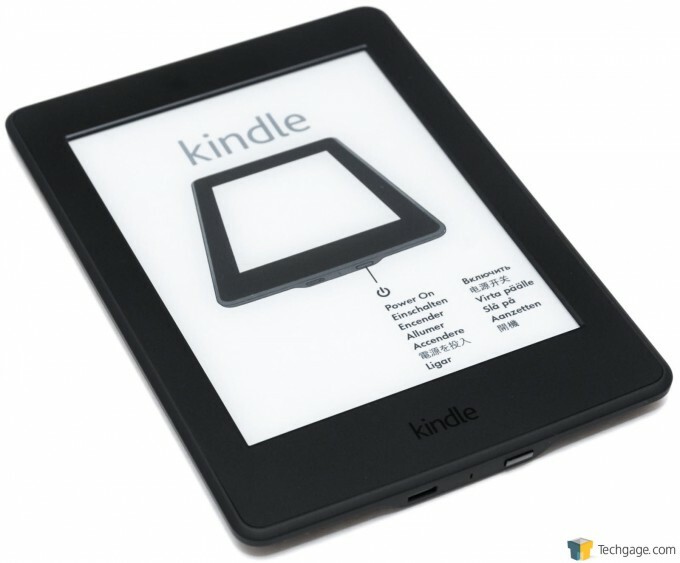 Paperwhite, like all Kindles, are not devices that need to be upgraded all of the time, (unlike our smartphones). It’s rare when a “killer” feature comes along that would warrant an upgrade, with the only one I can think of being the backlight capabilities of the higher-end models. If you own a previous Paperwhite, you don’t really need to be evaluating this third-gen one, unless of course yours has seen better days or has met an untimely demise. On the hardware front, the latest Paperwhite is almost identical to the previous one. It shares the same dimensions, has the same screen size, and can still use the same official leather covers. What’s new is a display that’s doubled in resolution, to hit the same 300 ppi of the Voyage, and a blacked-out logo on the front, which I think looks quite nice. A breakdown of current Kindles can be seen in the table below. All three of them are 6-inch in size, have a glare-free display, and 4GB of storage. With Kindle, the big differences involve small differences. 1 Based on 30 minutes of reading each day, wireless off, and brightness of 10 on backlit models. 2 Via a computer (faster with an AC adapter). 3 4GB equates to ‘thousands’ of books. With the third-gen Paperwhite, Amazon in effect makes the Voyage look a little less desirable. After all, the highlight of that model was its 300 ppi screen. What still sets Voyage apart is its ability to use an adaptive brightness, as well as its PagePress feature (pushing on the bezel turns the page). 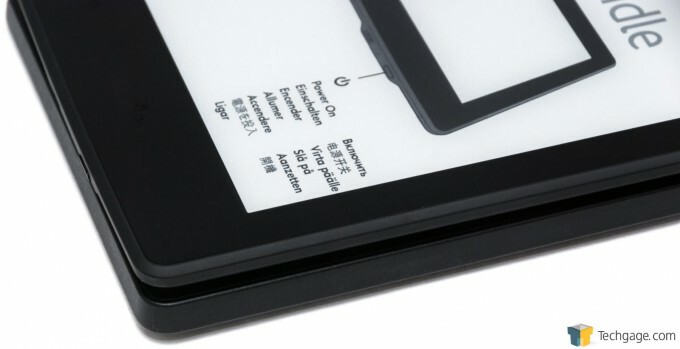 Voyage remains the lightest Kindle as well, and the thinnest, at 0.30-inch thick. I am not sure I could ever recommend the ordinary Kindle given its lack of a backlight (this is fine if you’re comfortable using a nightlight or lamp at night), and at this point, it’s hard to recommend the Voyage unless you want to pay $80 mostly for adaptive brightness and PagePress. While I do love the PagePress feature, $80 is a tall order. Something tells me that the second-gen Voyage will arrive this fall, because Paperwhite 3 simply closes the gap too much. So, let’s go on a hardware tour. Inside the box, only one accessory will be found: a USB cable. 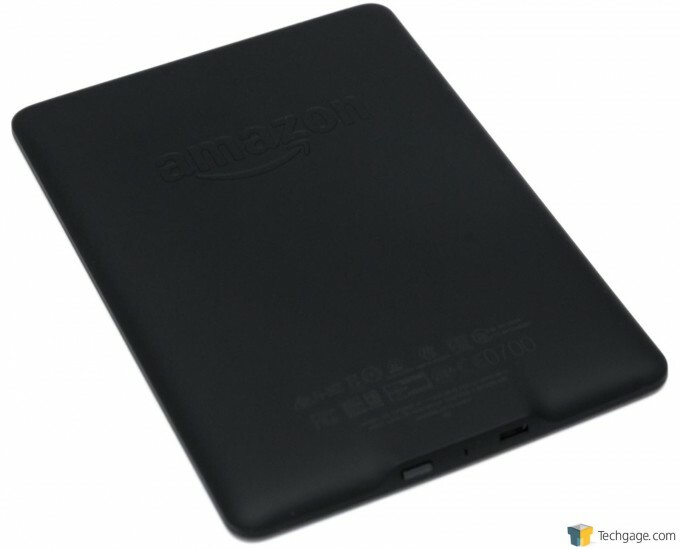 This can be used to both copy files over to the Kindle and also charge it up. Amazon says it will take about 4 hours to charge the Paperwhite to full if it’s plugged into the PC, but if you already have an AC adapter with a microUSB connector, you’ll be able to charge it up much quicker. Both the microUSB port and power button are located at the bottom of the Paperwhite. Out-of-the-box, the instructions for powering the device on are already loaded onto the screen – a cool perk of E Ink technology. Once you turn the device on, these instructions will disappear, and you’ll be able to set up the device. Compared to the current-gen Fire HD 7, Paperwhite is about 0.4-inch thinner at its thickest point. It feels great to hold, and not too flimsy. If you want to protect the device (and you probably should), most cases will dramatically improve the durability, of course at the expense of some added thickness. 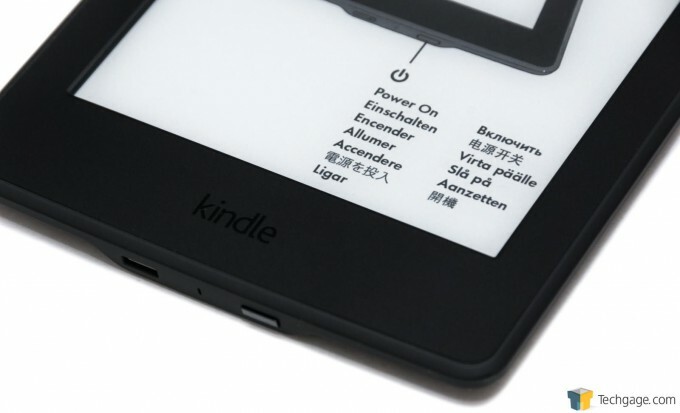 In case you’re using your Paperwhite outside of a case, everyone you face will see that you’re using a Kindle, thanks to a big Amazon logo near the top. 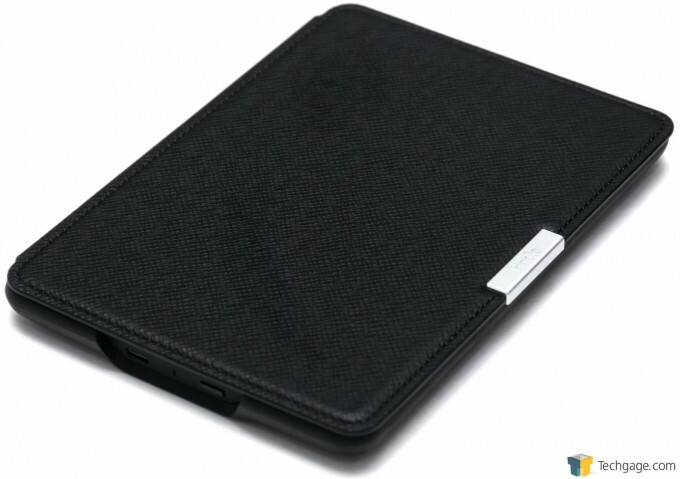 The official Paperwhite case, which Amazon sells separately, is leather on the outside and soft, super-fine fabric on the inside. If you’re upgrading to the Paperwhite from a previous model and happen to already have a case, you’re in luck: nothing’s changed. For those who like a bit of color, Amazon sells this official case in Ink Blue, Royal Purple, Persimmon, Saddle Tan, Honey, and also premium leather. This official case uses a sensor to tell the device when it’s covered. This isn’t as important as it is with tablets, since no power is drawn once an image is rendered, but it’s a nice touch nonetheless. There are a couple of big advantages to a dedicated e-reader over a tablet. At the fore-front, the screen is much easier on the eyes, and at modest backlight levels, looks little different from reading a real book. Even at full brightness, it’s still much easier on the eyes versus using a tablet that’s at low brightness. Beyond that, e-readers have unparalleled battery life, as well as an unparalleled lack of distractions. Because of the screen-type devices like the Paperwhite use, photographing them is quite easy. Below is what I consider to be an accurate representation of how the display looks, though I admit it’s hard to appreciate just how sharp it is without seeing it in person. 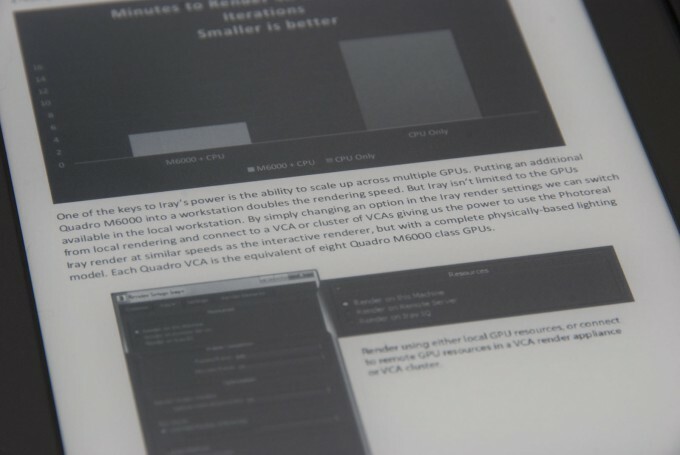 In the same shot, you can see an example of a PDF being rendered. 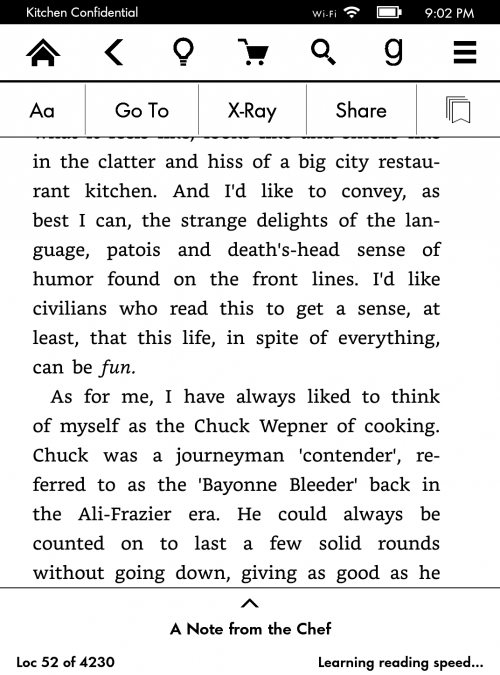 Despite it not being native Kindle content, the fonts are all crisp, and the images don’t look too bad, either. 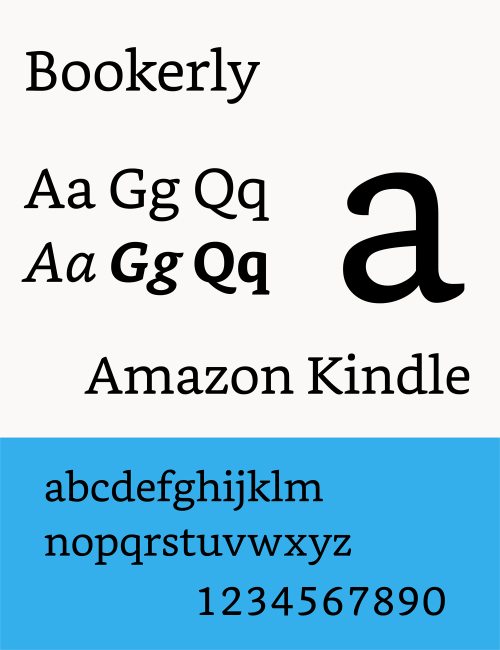 With this third-gen Paperwhite, Amazon is launching a brand-new font called Bookerly. It sounds fancy, but its goal is to be as readable as possible on devices like these, while adding benefits such as faster reading and reduced eye strain. An upcoming software update will port this font to other current Kindle devices. Bookerly replaces Caecilia as the default font, but it’s still available along with Baskerville, Futura, Caecilia, Helvetica, Caecilia Condensed, and Palatino. In total, there are 9 font sizes to choose from. Line spacing and margins both offer three different settings. Setting up the Paperwhite, like the other Kindles (and Fire tablets, for that matter), is a quick process. If you don’t have the 3G model, you’ll have to connect to Wi-Fi in order to access the store or cloud storage. Before long, you’ll be at the home screen, complete with recommended books, preloaded guides (and an Oxford dictionary), as well as quick access to previously purchased books that are sitting in the cloud. The icons at the top, from left to right, are Home, Back, Light, Shop, Search, and Goodreads. The hamburger icon at the absolute right is for accessing the system menu. 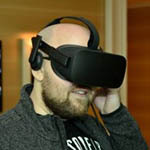 Being such a focused device, there isn’t too much in way of settings to adjust, but it’s still worth perusing them so that the device is as fine-tuned to your liking as possible. One thing I do recommend doing is loading up the user guide to learn the ins and outs of the Paperwhite, as for a new user, some of the required actions might be a little confusing at first (eg: getting back to the home screen or navigating a book). When inside of a book, the entire screen will be clean aside from the book’s text, location numbers, and progress. Location numbers are similar to page numbers, but are more accurate on devices like these because page 100 isn’t going to be page 100 for someone else if a different font size or margin is used. 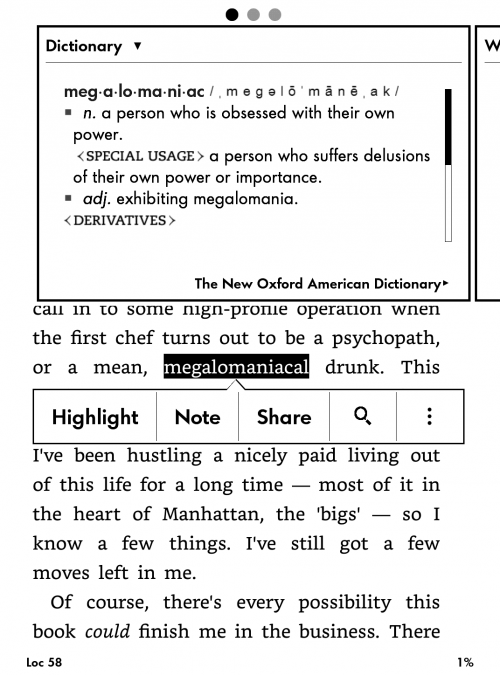 When in a book, the top of the screen can be tapped to reveal the menu, and from here, the fonts can be adjusted, pages can be skipped to, text can be shared, and the interesting “X-Ray” feature can be taken advantage of. If you’re reading a book and can’t remember who a character is, you can simply hold their name to get a brief synopsis with X-Ray. Similarly, you can also quickly get the definition of a word by holding it and bringing up the dictionary. From here, you can add a note, highlight it, and again share it. 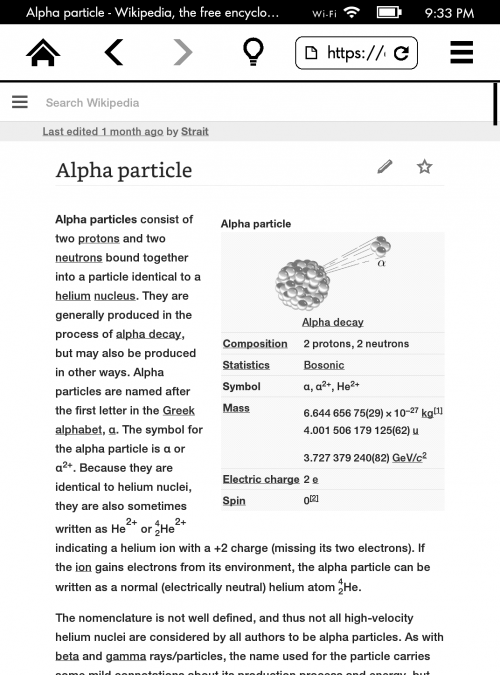 If the word is a vast subject, you can swipe to the right to read its entry on Wikipedia. As with the first two Paperwhites, this third-gen one includes a browser called “Experimental Browser”. It won’t take long to realize why it’s called experimental. While many websites load just fine, some will cause the browser to crash. Some will not even render properly – not even Amazon’s own site, if you can believe it. Still, it’s a nice feature to have, just in case you need to find some bit of simple information fast. As with the other Kindles, you’re able to purchase content right inside of the Paperwhite, but I’ll be honest in saying it’s a tedious affair. I’d much rather sit on the PC and browse books at a much quicker speed, but at least the option is here for those who want it. The book search looks great and works well, and the same goes for book reviews. If you do purchase content on a PC or other device, you’ll be able to easily send the content to the Paperwhite or any other Kindle-enabled device you have. Depending on the book size, you’ll likely have it ready on the Kindle within seconds of purchasing it. I mentioned at the outset that Amazon didn’t do much upgrading with the third-gen Paperwhite, but the truth is, it didn’t have to. The first-gen Paperwhite was a great e-reader, and so was the second. This third-gen becomes just another iteration that makes one of the best e-readers even better. 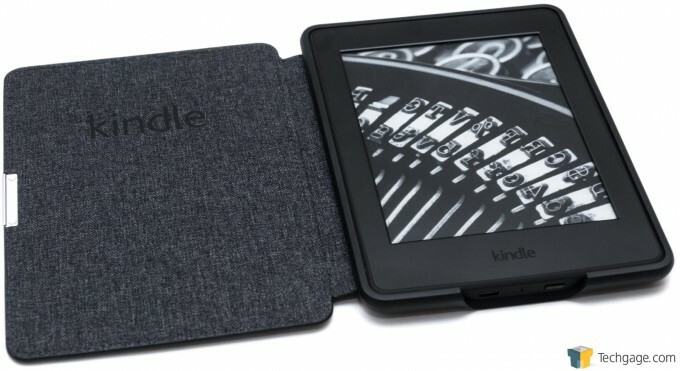 While it’s impossible to say that upgrading from an earlier Paperwhite to this one would be justified, those looking to pick up a new e-reader or update from the original Kindle (or a competitor) are in for a treat with this one. With all great products, there must be some downsides, and the Paperwhite is no exception. Fortunately, those downsides could affect few people. 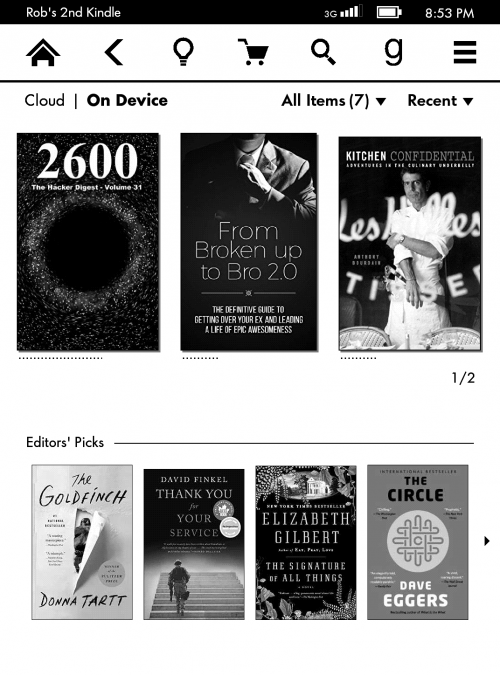 The lack of ePub file support might rub some the wrong way, especially when Kobo’s readers support it. The other main downsides owe their thanks to the Voyage: Both the adaptive brightness and PagePress features are quite nice, but are hard to justify for an $80 premium. Given the upgrades to this Paperwhite, I am looking forward to seeing what the second-gen Voyage brings to the table. Overall, the third-gen Paperwhite is a fantastic e-reader, and is hands-down one of the best out there. It’s backed by an enormous digital book store, offers free unlimited cloud storage (for Amazon products), has an incredible battery life, and boasts a high-res, crisp display. It’s simply excellent. In the US, the Wi-Fi Paperwhite can be had for $119, while the 3G tacks on another $70. In Canada, the base device costs $139, while the 3G model also costs $70 more. Taking into account the current USD > CAD conversion, Canadians come ahead ever-so-slightly (a relative rarity). Adding your own files to the device is easy (plug it into a PC like a flash drive). Official leather case looks and feels great, but is expensive (~$40). Experimental browser is experimental for a reason.